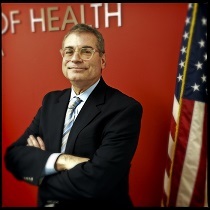 Michael Kharfen is a member of the DC CFAR Executive Committee as a representative of the DC Department of Health. His interest in HIV started in 1985 when he began hearing rumors about the bleak living conditions of AIDS patients on Rikers Island, the New York City prison complex. At the time, Kharfen was working as a community liaison for David Dinkins, the Manhattan borough president, who would later become mayor of New York City. Based on Kharfen's assessment of the conditions on Rikers, Dinkins successfully advocated to improve the conditions for the AIDS patients there. In 1994, Kharfen moved to the DC area to work for the U.S. Department of Health and Human Services in the Administration of Children and Families. Kharfen was involved with several collaborations between the ACF and the DC Department of Health. In 2006, the DC Department of Health offered Kharfen a position to work as the Bureau Chief of Partnerships, Capacity Building, and Community Outreach. Today, Michael Kharfen is the Senior Deputy Director of the DC Department of Health's HIV/AIDS, Hepatitis, STD, and TB Administration (HAHSTA) and a member of the DC CFAR Executive Committee. As the head of HAHSTA, Kharfen seeks to respond to the epidemic by using evidence-based approaches and promising practices. So far, HAHSTA has implemented population-focused HIV testing, condom distribution, needle exchange, and Pre-exposure prophylaxis, or PrEP, for men and women. Some of these interventions, Kharfen notes, draw directly from the research that DC CFAR investigators have produced. As a member of the Executive Committee, Kharfen sees the role of the DC CFAR as a way to engage more people in HIV research. As a multi-institutional endeavor, the DC CFAR includes a broad array of members and organizations in academia, medicine, and the community, something Kharfen refers to as the "DC approach." The Department of Health's role, Kharfen says, is to provide the DC CFAR with an "on-the-ground" understanding of the outbreak so that researchers can have a better grasp of the current situation in DC.